Stickerkitty is collaborating with The Weave: Mediocracy Unspun on a new project entitled Weaving the Streets & People’s Archive (WSPA). John Collins, professor of global studies at St. Lawrence University and co-founder of the Weave, and I put together a proposal to create “a new blog and digital archive that will document the creative ways in which ordinary people make use of public space to express themselves” (excerpted from our proposal abstract). We learned on Monday that our proposal was accepted and will be funded for the first two years by a grant from the Mellon Foundation’s Crossing Boundaries: Re-Envisioning the Humanities for the 21st Century initiative at SLU. WSPA will complement the Street Art Graphics digital archive that is presented on the SLU art gallery Web site. Street Art Graphics exists at this point as a catalogued image database. For WSPA, however, team members will gather street ephemera, conduct research, and write about various topics in blog posts. One of our first bloggers will be Lukasz Niparko ’13, the SLU alum I visited in Poznań, Poland, last June. I think he is going to write about Rozbrat, the oldest occupied squat in the country. Lukasz and I spent an entire day touring around the city and photographing street art. 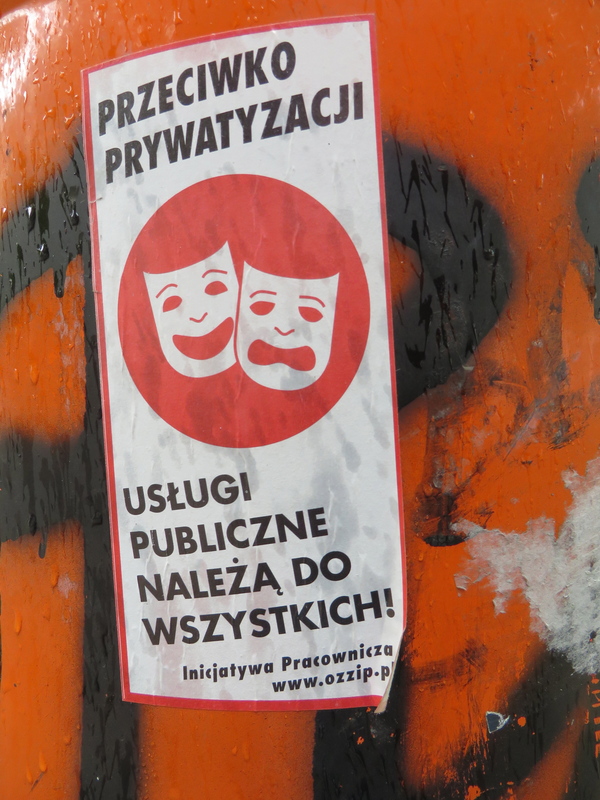 “Miasto to nie firma” in the modified sticker below means, “The city is not a business,” in response to urban re-development and the privatization of public spaces in Poznań. 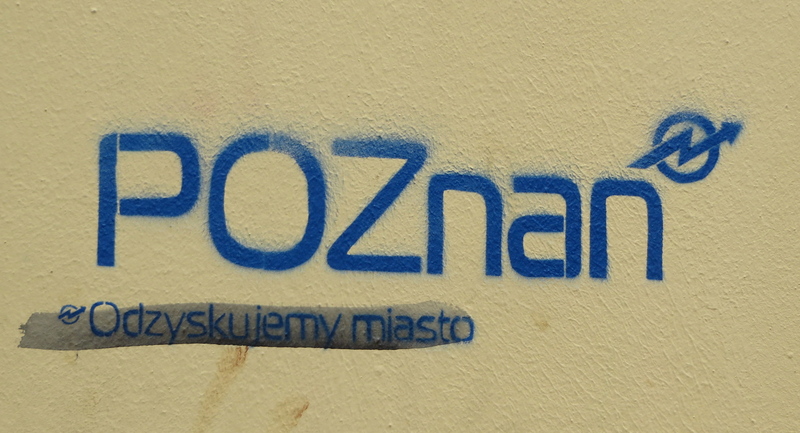 “Odzyskujemy miasto” in the stencil below also comments upon this issue with “We recover [reclaim?] the city.” The sideways-looking N on the right is the international squatters’ symbol.